Most of us enjoy seeing cottontail rabbit families in our yards (unless they are nibbling on our lettuce, of course). They’re definitely cute. The bunnies we see in our yard are almost certainly the hybrid Eastern Cottontail. The “real” New England Cottontail has become threatened here due to loss of habitat. It is very difficult to distinguish New England cottontails from Eastern cottontails. The native New Englanders are a bit smaller, and have ears trimmed with fine black fur. They lack the white forehead spots common on Eastern Cottontails. The historic range of the New England Cottontail has always been small; southern Maine and New York, Vermont, New Hampshire, and south to Rhode Island. These rabbits depend on small early succession forest patches within a larger habitat of forest and shrub wetlands. They eat the shrubby undergrowth that abounds in young forests. It is thought that historically they thrived in habitats along waterways, disturbed by hurricanes or fires. But due to development, forest fire suppression, and the introduction of alien invasive shrubs such as autumn olive, barberry and honeysuckle, New England Cottontails have lost 80 % of their former habitat. They are listed as threatened in Massachusetts and Rhode Island, endangered in New Hampshire and Maine, and extirpated from Vermont. A recent article by nature writer Ted Williams entitled “Recovery: Second Chance for Yankee Cottontails” appeared June 7, 2017 in a Nature Conservancy blog called Cool Green Science. Williams states that the Eastern Cottontail is a hybrid mixture of cottontail breeds. 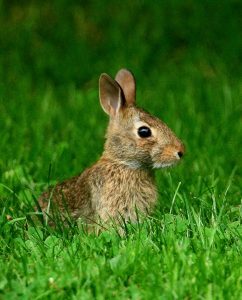 It was introduced repeatedly from the late 1800’s through 1970 by hunting clubs and fish and wildlife services, and is so hearty that it has outcompeted our native cottontail. New England Cottontails are dependent on early successional forest, which we have pretty much run out of in New England. Eastern Cottontails, however, do well in all habitats, especially suburban yards and edges. The article discusses a new public-private partnership, called the New England Cottontail Initiative, that is undertaking young-forest restoration. Local zoos are breeding the natives for release. The first releases took place in a 144-acre Nature Conservancy preserve in Dover Plains, New York. Here small patch clear-cuts are growing back into thicket. New England cottontails have recently been found on the Nature Conservancy land in Lyme, Ct., and management is starting there to provide the early forest patches these rabbits need. And even closer to home, captive-bred New England Cottontails bred at the Roger Williams Zoo in Rhode Island, are being released at the Bellamy River Wildlife Management Area in Dover, New Hampshire. Next time you see a cottontail in Westford, check it out with binoculars. Some day, you might be lucky enough to see one of those New Hampshire bunnies, a native New England Cottontail. Dot Mooney, Monadnock Dr. June 20, northern catalpa tree in back woods is covered with bright white blossoms. Heard a great-crested flycatcher. New batch of young downies on deck, begging parent for suet. After sunset, one bat flying over lawn. June 21, one hairy woodpecker on suet. At Howard Rd. wetland, one painted turtle poking around edge. June 22, at Buckingham Drive, wooden bridge over Beaver Brook. Cottontail bobbing away as fast as it could go. Heard red-winged blackbird, grackles, robin, blue jay, common yellowthroat, great-crested flycatcher, many white yarrow and evening primrose blooming. June 23, at power lines on Beaver Brook Rd., lots of daisies, white yarrow and Deptford pinks. On Forge Pond, pair of swans with at least three youngsters. In my busy birdbath on front step, four house finches enjoying water at same time, drinking and bathing. June 26, a family of blue jays around. Heard two white-breasted nuthatches. Great to have more babies around again. June 28, At Howard Rd. wetland, saw a young female wood duck in water, eastern phoebe, common yellowthroat, red-wined blackbird, catbird and tree swallow. Bullfrogs calling, various sizes of painted turtles, heads popping up in different paces. At bridge on Beaver Brook Rd. heard warbling vireo and saw swan parents with their two brown and white youngsters. Under power lines on Parkhurst, pine warbler, chipping sparrow, crow, robin, song sparrow, towhee, flicker and catbird. Yellow cinquefoil blooming now. Three red-tailed hawks circling over back woods. June 29, hummers on sugar water feeder. June 30, young downies on deck for suet. Waiting for a parent, they finally gave up and slowly began to try to figure out how to get suet. Little chipping sparrow happily picked up tiny pieces that fell onto deck, and off he went. Kate Phaneuf, Drawbridge Rd. June 28, at the old beaver pond behind my house, spotted a couple blackbirds flying above the reeds. Two small brownish birds diving and pestering a hawk soaring above. Spent time removing oriental bittersweet from my yard. One tree had thick coils of the vine choking it. I removed it and the tree, which looked close to death, is now thriving. Nancy Eberiel, Depot St. July 2, a red-tailed hawk took a bird from a shrub near the bird feeder. Marian/Bill Harman, Chamberlain Rd. July 2, the three Carolina wren babies fledged from their nest on our porch at 9 a.m. Two of them followed their parents right through the hole in the screen, but one got confused. We went inside, and soon the parents had talked the third one through the screen too. July 22, one of the parent wrens came onto the screened porch and checked out the old nesting site. Dot Mooney, Monadnock Dr. July 2, at 2:45 p.m., my cat had been looking out the window downstairs and then suddenly ran upstairs and out to porch to look out that window. I followed her to see the scary thing that sent her out there and saw that there was a coyote trotting along at the edge of the back lawn very near our building, alert for anything he could pounce on. Long row of sumac along back woods covered with blossoms now. Daisy fleabane and fragrant milkweed blooming beside lawn. July 6, at Howard Rd. wetland, and eastern kingbird landed nearby, waiting for an insect. A noisy female wood duck flew to far side of water. close by the water, a swamp honeysuckle covered with fragrant sticky white flowers. July 7, small cooper’s hawk scattered all the birds. July 11, hairy woodpecker feeding suet to a puffed out youngster, being watched by a little downy. Ginger Dries, Sherwood Dr. July report, the wrens are nesting again in one of the birdhouses, female turkey here almost every day, lots of bunnies. All the regulars are at the feeder, jays, finches, chickadees, three pairs of cardinals, mourning doves, titmice and woodpeckers of all kinds. The chickadees wait right on the feeder while I fill it, not a hand length away. The hummingbirds are still here but not as frequently as before. Diane Duane, Howard Rd. found a six-spotted tiger beetle, beneficial to gardens. Also a nest full of small gypsy moth caterpillars. July 19, saw first monarch butterfly. Donna Cecere, Calista Terrace. July 9, pair of lovely birds building a nest in one of my birdhouses with sticks. Very tiny brown birds with very loud song, probably house wrens. Alan Emmet, Concord Rd. July 9, screech and barred owls heard at night–Wonderful sounds! Kate Hollister, Vine Brook Rd. July 18, hundreds of box elder bug nymphs crawling around near a maple tree for about a week. Watched an osprey dive for fish at Keyes Pond. A scrawny grey fox crossed Vine Brook Rd. Bullfrogs are croaking at Kennedy Pond. House wrens are using one of our birdhouses. Chipmunks and red squirrels are tearing the fiber backing from our grill cover for their nest. Finally saw a hummingbird at our feeder. Kate Phaneuf, Drawbridge Rd. July 20, pretty swallowtail butterfly flitting around forsythia at the back of the house. Great blue heron at the beaver pond. A few blue dragonflies and a few red ones at the pond. Four large crows squabbling over a dead chipmunk by the side of the road. blueberries starting to ripen, both high and low-bush. Flowers in bloom: spotted wintergreen, yellow oxalis, fleabane, clover. July 23, goldfinches picking some of the cotton fluff from my nesting materials ball. Blue dragonflies like the rhododendrons at the front of the house. An occasional roaming turkey or two seen crossing Palace Rd. Catbirds seen at pond and yard. Fruiting bodies of all kinds of fungi: Two dark stinky ones in the woods, many little rounded orange ones, weird-shaped ones, etc. Marilyn Day, Graniteville Rd. July 26, steeplebush is now in bloom. Rosemarie Koester, Providence Rd. July report: robins, house finches, goldfinches, tufted titmouse, chickadee, nuthatch, several blue jays, grackles, turkeys. Two pairs of cardinals. A cardinal nest is in our forsythia bush, baby seen with parents feeding it. One baby fledged, one egg left, which disappeared by next day. Red-bellied woodpecker pair, downy woodpecker pair, rose-breasted grosbeaks here often, male female and juvenile. Many ruby-throated hummingbirds. mostly females. I have to refill the hummingbird feeder every two days. Many small birds having fun in the bird bath. Turkeys, four gray squirrels and chipmunks also drink from it. Many bunnies eating my flowers, red squirrel quarreling with gray squirrels. The chipmunks like to eat the roots of the plants on the deck. Marian Harman is a member of the Westford Conservation Trust, a non-profit conservation organization dedicated to the protection of Westford’s open spaces and trails. The Trust welcomes new members and volunteers. Check out the Trust’s website at westfordconservationtrust.org or visit us on Facebook.